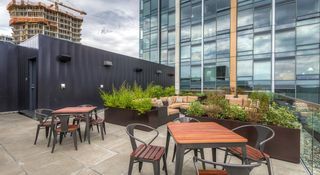 From the central 1st Ave. location, your apartment at Sequel situates you within walking distance of the world-class dining, trendy nightlife and iconic sights of downtown Seattle and the popular Pike/Pine Corridor. Sequel residents receive VIP treatment at The Nest, a rooftop lounge offering a panoramic view of the city and Olympic Mountain Range. Pick up a latte from the very first Starbucks, order a craft cocktail at Zig Zag Café or make a shopping excursion to Westlake Center. Residents also love the easy access to Highway 99, I-5 and the city’s excellent public transportation. Reach out today.